The Violence in This Week in Gaming Apps is Simply Enthralling. Appalling. I Meant Appalling. 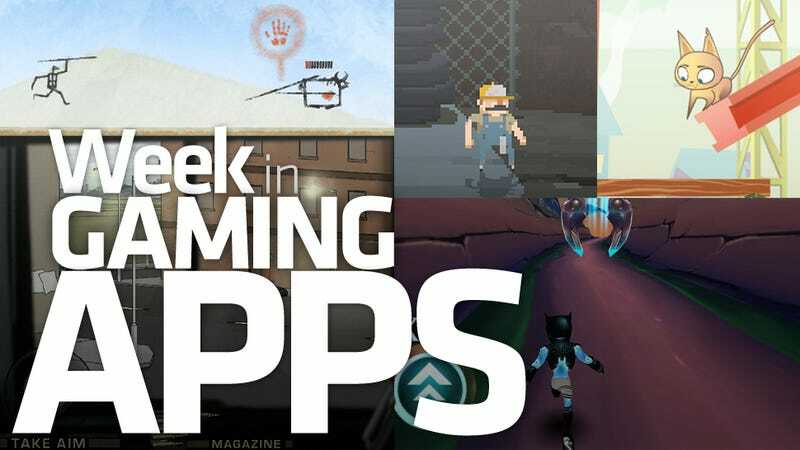 Our weekly roundup of the new mobile games we've played over the past five day period is usually filled with physics puzzles and endless runners. Those things are indeed present this week, but tempered with some good old-fashion shooting people in the head. Oh don't worry, they're mostly stick people. I've been passing up the stick-figure sniping genre for far too long. When I shoot, I prefer to do it from as far away as possible. It's a skill thing. Also a being afraid of getting shot back thing. Man, have I been missing out. If all the stick snipers are as enjoyable as Simon Hason's Tactical Assassin, my bathroom breaks are going to get incredibly lengthy over the next few weeks. And then there's Overkill 2, a game with a wide variety of firearms as a selling point. Normally this would do absolutely nothing for me, but I find myself intrigued by collecting and modifying guns. I don't know what it is. I'm just in a shooty mood. It might not be much more than a shooting gallery, but Overkill 2 is oddly appealing, with a large selection of weapons and mods to make them weapon better. The latest character-driven puzzle sensation from the folks at Disney, help Mittens get his milk with physics. Physics is the best. Go physics. Cave paintings come to life in this spear-chucking game of prehistoric survival. Really dig the style here. Unique. A story-driven running game with a sharp and distinctive visual style and a neat acceleration gambling mechanic. I love glowing blue people. The Kickstarter failed, but the dream is still alive. 3D Attack's 2D retro platformer arrives on iOS, crying out for physical controls, which would make it perfect. I am contractually obligated to play anything involving shooting colored bubbles with other colored bubbles. I was really hoping this was a Big Bang Theory game, but it's an endless-running take on the classic tale of the tortoise and the hare instead. Works for me. A really interesting puzzle game for the non-color blind, Blendoku challenges players to arrange squares by hue progression. Loving this one. Simon Hason's hit web series comes to life, then gets shot in the head. It happens. Finally my love of sniping gets the best of me, and I love what I see.